The Fourth of July in 2012 was a glorious day in the state of Minnesota. Zach Parise and Ryan Suter joined forces to play for the state of hockey with matching 13-year, $98-million contracts. The signing changed the culture and fan outlook instantaneously for a team that had failed to make the postseason for four straight years. Even when the Wild made the playoffs prior, they couldn’t advance past the first round after the 2002-03 season. The added veteran leadership, as well as a slew of young prospects, immediately propelling the team into playoff contention. The significance of the Parise and Suter signings is that it remains the most important day in Wild history. Despite that, we are in year six of the 13-year contract and no Stanley Cup appearance or even Western Conference Final appearance has happened. With seven years left and the two veterans not getting any younger, it becomes more and more likely that they will live out their contracts without a Stanley Cup. One of the bigger things that has prevented Minnesota from making a big run is the salary cap hit that is tied into these two players. Each is costing the Wild an arm and a leg. 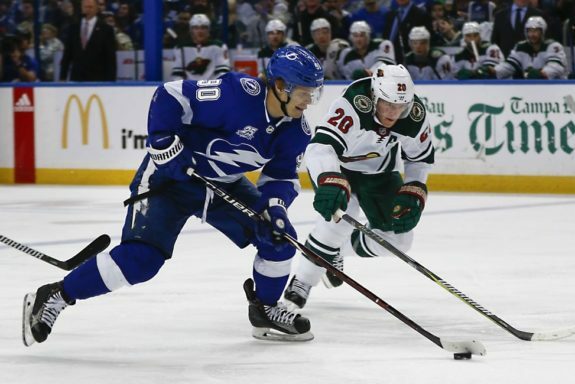 If the Wild could have glimpsed into the future, if the two players had decided they did not want to play together and if the Wild had a choice between the two with one of their contracts erased off the books, which player would they choose? Suter has been on a tear this year, and at 33 years old, he does not seem to be slowing down. He has six goals and 41 assists so far on the season, only three goals and two assists from matching his career highs with 13 games remaining on the season. He does have a plus/minus of minus-3, which would be the second-worst output of his career and worst since signing with Minnesota. However, his play has been instrumental in the Wild’s defensive core setting the franchise record for most points from the blue line in a single season. Even though his ice time is at the lowest it has been since his Nashville days, Suter is having one of his best seasons. Personally, I have believed that Suter would thrive with less ice time because he always looked so tired on the ice. Whenever someone forced a turnover, Suter was sluggish and had no hustle which resulted in goals against or a trip to the penalty box. However, his most important attribute has been his availability. The Wild are 69 games into the regular season and he hasn’t missed a single game yet. The best ability is availability, and that is something Parise hasn’t been able to offer the Wild this season. He has played in only 30 of the 69 possible contests this season. If all goes well from here on out, Parise will have participated in just over half the games in the regular season. Lack of play has fueled his lack of appearances on the score sheet. So far this season he has seven goals and seven assists. His plus/minus is minus-3 (which matches the output of his previous two seasons). Parise is also on pace to have his second-worst shooting percentage of his career. Currently, Parise is shooting at 8.1 percent; the only season worse was in 2010-11, where he shot at 6.1 percent. Surprisingly, that year was also wasted by injuries allowing him to only appear in 13 games for the New Jersey Devils. Parise is also clocking in at 16:59 of ice time per game, his worst outlook since being a 21-year-old rookie averaging 13:08 per game. The biggest impact Suter has had in Minnesota is his dependability. Six seasons in, he has only missed five total games. All of those contests stem from the 2014-15 season, including his suspension for elbowing Steve Downie. Another huge contribution that Suter has made is aiding in developing the defense. He shouldn’t get all the credit but guys like Jonas Brodin, Matt Dumba, and Jared Spurgeon have all stepped up and become key contributors for the Wild. Suter is the premier defenseman for Minnesota and the focus is generally on him allowing others to thrive and in some cases use their offensive skills to create more scoring chances. Suter is a two-time All-Star and has made the All-Star first team once with Minnesota. These are accomplishments that no other defenseman has made in Wild history. In 2015-16, Suter posted 43 assists, which is tied for the seventh-most in a single season in franchise history. This season he is on pace to shatter that record. No other defenseman has had a top-10 assist season for Minnesota. In addition, Suter holds the single-season record (along with Jason Zucker) for plus/minus with plus-34 set in 2016-17. Parise has managed to play one full season with Minnesota during the six-year stint thus far. That season came all the way back in 2012-13, where he played all 48 games (lockout-shortened season). Parise has missed an astonishing 87 games since signing with the Wild, and that does not include the playoffs. I’ve always thought that Parise is somewhat injury-prone, but it was never this bad in New Jersey. So far he has scored 131 goals, 134 assists, and 265 points in 358 games. In 2015-16, Parise tied Marian Gaborik’s franchise record for most hat tricks in a single-season with three. That year, he also posted seven game-winning goals good enough to tie him for fifth all-time in franchise history. In 2013-14 he was able to finish the season with 245 shots, beginning his offensive impact. It all came together in 2014-15 when he had his best season in Minnesota. He upgraded his shot total to 259 and had a plus/minus of plus-21. He also managed to become the fourth player in franchise history to score 30 or more goals in a single season, finishing with 33 (fifth all-time). Missing 87 games is huge when the best ability is availability, and it is a much more impactful number than five. Parise had a couple of years early in the contract in which he delivered results that Minnesota was surely at the very least content with. He has been on a steady decline ever since and looks to never be the player he once was with the Devils. Suter, on the other hand, has been everything you could want. He has been a leader, consistent, and been recognized for his efforts with accolades. If the Wild could have a re-do and acquire Suter without Parise, they would be foolish not to.